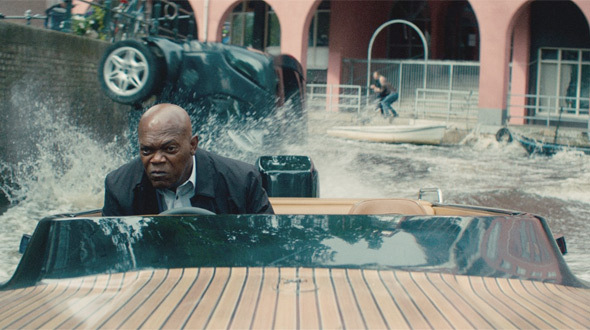 There is as much bad as there is good in The Hitman's Bodyguard, the latest in the recent slew of buddy action-comedies that have been barreling down the pike. Thank you for that, Shane Black. While that appreciation is genuine, there is a certain lull this particular sub-genre has quickly slid into, and there are definitely prerequisites an entry into this sub-genre appear to have to meet to satisfy some audiences. The Hitman's Bodyguard has no problem meeting all those prerequisites, but, while the buddies at play here (Samuel L. Jackson as the hitman and Ryan Reynolds as the bodyguard) seem to be having a blast with their back-and-forth verbal spars, the overall cheapness and familiarity of the film leaves plenty of room for improvement. At the very least, rest assured that Jackson drops a plethora of "motherfuckers". We're introduced first to Reynolds' Michael Bryce, a freelance agent who specializes in protecting the more threatened of subjects. These are people who plan to testify against the more dangerous figures of the world, most notably Darius Kincaid (Jackson). The main issue: Kincaid is Bryce's sworn enemy. While there seems very little chance of a full-blown bromance blossoming between the two, they must learn to, at least, coexist in order to get Kincaid to the International Court of Justice in The Hague. It's here where Kincaid is to testify against a ruthless, Eastern European dictator named Dukhovich (as played by Gary Oldman), but, as with most sadistic dictators on trial for genocide, the antagonist will stop at nothing to keep the two from making their destination. If nothing else, Bryce and Kincaid might end up killing each other if the mercenaries don't get to them first. Written by screenwriter Tom O'Connor, the majority of The Hitman's Bodyguard takes its time setting up and knocking down all the necessary elements that make buddy action-comedies such an entertaining sub-genre. The two protagonists seem to feed on their hatred for one another, getting more of a jolt from the barbs their flinging at one another with their mouths than they are the bullets their firing at the actual enemy. It's a formula seen time and time again, though, and O'Connor doesn't switch it up enough nor adds enough fresh blood to the mix to keep you invested in the ultimately predictable story. His secondary characters are as shoddily crafted as the general structure of the film, leaving you with very little interest in what's going on outside the primary team-up. Thankfully, the film's drawback of a screenplay and its structure are aided tremendously by the direction of Patrick Hughes, who broke out with the solid action/thriller, Red Hill, and delivered The Expendables 3, the most entertaining entry of that series for what it's worth. O'Connor's script does provide plenty of action set pieces, and Hughes' direction utilizes each one to offer up an abundance of over-the-top and stylized excitement. A good portion of it follows the tried-and-true dynamic of the shaky cam, but the moments of visual instability are equally matched with impressive stunt work and exciting bouts of energetic action. The film is practically bloated with engaging action that keeps the overall momentum from ever turning into a slog even if it all does go on a little too long. Also helping the film's momentum is the chemistry of hate that plays out between Reynolds and Jackson. The two actors are pretty much playing themselves here making the characters essentially nonexistent, but that doesn't keep the entertainment at bay by any means. While it's difficult to separate the script from what is being ad-libbed, it all slips by with breezy delivery from the actors involved. Reynolds' sardonic attitude bounces off Jackson's badassness without a moment of biting entertainment lost, and vice versa. The two have such good chemistry in the way they play off one another it becomes more of a shame the overall structure built up around them isn't stronger. It is, at the very least, an enormous amount of fun watching the two dig at each other while causing copious amounts of property damage in order to survive. The performances of the secondary cast could have also benefited greatly from a stronger screenplay, but everyone appears to be having a good time with it all. Oldman dusts off his Eastern European accent to deliver a fun if obvious turn as the film's central antagonist. Elsewhere Salma Hayek seems to be having the time of her life as Kincaid's wife who very well could be as dangerous as her assassin husband. She also likes to drop her fair share of "motherfuckers" around, and it ends up being a performance entertaining enough to wish for more screen time. Élodie Yung gives a solid performance as Bryce's is-she-or-isn't-she significant other, but, against, it's a performance screaming for a more solidly developed character. This is the case with much of what's going down in The Hitman's Bodyguard. The numerous entertaining performances and exciting spats of ridiculous violence deserve more than the slapdash writing involved, but none of the film's benefits are able to effectively counterbalance the film's issues overall. It ends up being a frustrating watch overall, but the film's ability to satisfy on an enjoyment level can't be denied. The Hitman's Bodyguard, while nowhere near the least successful entry into the buddy action-comedy sub-genre, is an entertaining mess that has just as many elements to commend as it does problems.